In 2004, eteam first visited their newly acquired property in the surrounding area of Montello, and happen to notice an abandoned landing-airstirp nearby. eteam began investigating the history of the airstrip. Their inquiries were unsuccessful in terms of information, but they were socially productive. They began developing a friendly relationship with people from Montello and the region. In one of many conversations between eteam and the Montellonites, the artists suggested they collectively construct an international airport in that seemingly unclaimed and clearly abandoned landing strip. The airport didn’t have to be physically constructed, eteam said to them. Instead, eteam proposed to the Montellonites that the airstrip could be conceptually built through events. These events, they collectively envisioned, would revitalize a culture around the airstrip, and in turn could be instrumental to igniting further developments in Montello. For both eteam and the townspeople, the International Airport Montello (IAM) was a way of creatively connecting with the outside world. A number of Montello citizens agreed to revamp the interiors of local restaurants and businesses of Montello into a place “like any other airport,” and eteam began developing stories, shooting photographs and video of the so-called daily operations at the airport while some people from Montello began performing as travelers and support staff. The idea was that the production of these actions and images would intensify progressively until the idea of the airport was confused with its actuality. 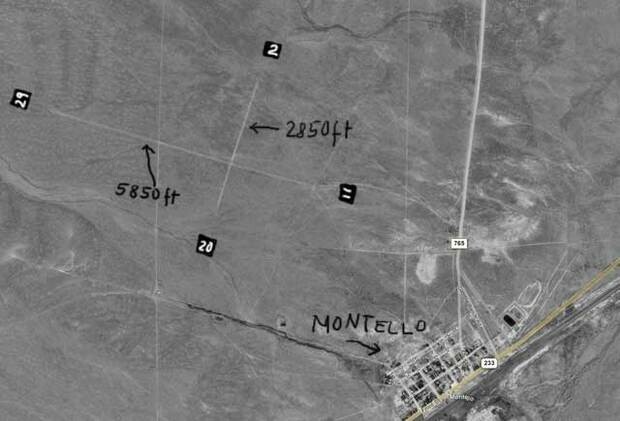 It's worth giving some context about Montello: Like many desert towns in the United States, the town of Montello seems to be in the middle of nowhere, economically depressed, and with little to no prospect for improvement. The service economy propelled by neighboring casinos is its main source of employment. Other neighbors include the US Air Force, whose main activity is military training and bomb testing, and Wendover Field, a relic of what used to be most important military airbase in this country during the Second World War. The population of Montello, at that time, was roughly around seventy people, and it will be accurate to say that most of them participated in one way or another, at some point or another, in IAM. For Art in General, eteam’s proposal for IAM meant many things. Most importantly, the commission meant collaborating with the artists in the organization of events and creation of communication pieces that would introduce the airport as an actual site to the public outside of Montello. Each occasion required a new performance, and, much like the Montellonites, staff members of Art in General participated by changing roles time after time to accommodate the discursive construction of the airport. This way, the project slowly began changing the very workings of the institution. For example, Art in General’s former Development Director, Yvonne Garcia, temporarily turned her office into a functioning, private travel agency, while Anthony Marcellini, leaving behind traditional duties of a Curatorial Assistant, was helping set-up the New York hiring agency for the IAM or driving the IAM airport shuttle here and there. My role at the time was Curator and Programs Manager of Art in General, but for the project I was at once a creative in a marketing team; at times either a travel agent or a passenger; sometimes a tour guide and once even performed as a professional flight attendant. We first introduced ourselves to the people of Montello through correspondence; that was late 2005. Then, after some determined persuasion by eteam, Art in General furnished the town with a computer and hooked up a satellite dish there so Montello could have high-speed internet access. The equipment was conveniently located in the city’s main gathering point, the Chapel of the Midnight Sun, where the town’s food bank is also located. Some of the first signs of existence of the IAM began circulating through a wiki-website managed by the eteam and the Montellonites. The website has multiple entries, authors, and memories from Montello, including animations by the Montellonite known as Nevada Red (some of which appeared in the video installation by eteam that was exhibited at Art in General in 2007, more on this below). While activities were taking place at the IAM in Nevada, back in New York programs were happening too. In June 2006, in a program at the New School’s Vera List Center for Art and Politics with writer Jeffrey Kastner and Matthew Coolidge of the Center for Land Use Interpretation, eteam presented IAM to New York audiences. Weeks later, curators Jeffrey Walkowiak and Rachel Gugelberger of Sara Meltzer Gallery helped eteam turn that gallery’s penthouse into an airport gate. Audience members casually did nothing or a little of something. They simply waited. At those events, Art in General announced that it was planning a unique art getaway to Las Vegas in the fall of 2006. While the travel package included a creative array of activities, particularly in Las Vegas, as well as to visit land art in the surrounding area (including Michael Heizer's Double Negative), it also entailed flying to IAM on our way there and staging the numbness that is experienced in a typical layover in any other airport. For this major, collective art happening, we rented a private jet and got permission to land at IAM (in reality, the landing strip of Wendover Airfield). All the while, eteam and the Montellonites turned the town into the IAM terminal. Before the layover, and after an open call designed in the form of a job posting, IAM “hired” the Brooklyn-based artist and writer Jason Dean as one of its Layover Crewmembers. Hiring was a way of inviting someone else to experience the IAM, and a way of giving a free ride to a person interested and willing to play a creative role during the “layover” at IAM. The hiring process would also enable someone to compete for a free seat without relying on the strict, merit-based criterion of a grant or the pure luck of a raffle, but on the quest for adventure and curiosity –and with so many good candidates, it was a difficult hire. For a weekend in September 2006, the town of Montello turned their cafeterias into the airport’s food court; the town’s church became the information booth; the bars morphed into the airport lounge. The citizens of Montello enacted roles of airport employees, and the travelers were invited to “assume” that the town was the IAM itself and consider their stay there simply as a layover. Montello became a theatre, its people and visitors the actors, and the play–an abstraction of what a layover is–much of nothing. The willingness of every participant, whether citizen of Montello or cultural tourist, made the happening unique, collapsing the extraordinary and yet minimal characteristics of land art and the affective nature of performance. Through the hiring process, we learned that Jason had been attending the IAM events in New York, and had been following-up the project development through its website. He had begun articulating his own views and questions about the project–from whether the airport existed or not to what the “public programs” were really about. His closer participation as an “employee” of the airport who experienced the “layover” in September, marked a shift in his writing. Jason’s articles about the IAM were originally published in the online art-journal Big, Red, and Shiny. In October 2006, another program was designed for New York City audiences. Thanks to Linc Hallowell, a historian and park ranger of the National Park Service, eteam used the runways of Floyd Bennett Airfield in New York City to connect that airport to IAM. For this event, eteam created an over 60-foot-long drawing in the shape of an airplane, and invited the public to act as a pilot or passenger. During these last couple of years, the relationship that Montellonites have with eteam’s work has developed significantly. From subjects, they grew to be agents and collaborators. This largely has to do with the liberties that eteam gives to the public in their event-based work: After a “situation” is presented (e.g. this is a waiting gate; we’re experiencing a layover; now we are flying), there is little to no direction. You chose what you wanted to be, and you were responsible for carrying out your role. It is pretty much an open-ended situation and unscripted moment that eteam offers. In January 2007, we presented at Art in General an exhibition of IAM, consisting of a multi-channel video installation and including a mural with a satellite map and photographs indicating the location of IAM's landing strip, terminal, baggage claim, VIP lounge, cellphone booth and eteam’s property, is a working that creates another narrative of the IAM, a memory that once again makes that place become alive. For information about the exhibition, as well as for details of the events above mentioned, please go here. Some time shortly after the exhibition, Art in General published a series of print-on-demand books of its New Commissions program, of which eteam's IAM was part of. Their book in specific includes an introduction of the IAM project by me, as well as an essay by Cecilia Alemani, a selection of entries from the IAM wiki-website, and the two-piece travelogue by Jason Deam published originally in Big, Red, and Shiny. It is illustrated with documentation of several events, materials, and such that were taken during the project's development. This book was designed by Project Projects, and can be bought here.